Moviegoers aren't being gouged when they pay big bucks for popcorn, says economist Ricard Gil. The following press release was prepared by the Stanford Graduate School of Business. New research from Stanford and the University of California, Santa Cruz, suggests that there is a method to theaters' madness--and one that in fact benefits the viewing public. By charging high prices on concessions, exhibition houses are able to keep ticket prices lower, which allows more people to enjoy the silver-screen experience. The findings empirically answer the age-old question of whether it's better to charge more for a primary product (in this case, the movie ticket) or a secondary product (the popcorn). Putting the premium on the "frill" items, it turns out, indeed opens up the possibility for price-sensitive people to see films. That means more customers coming to theaters in general, and a nice profit from those who are willing to fork it over for the Gummy Bears. Indeed, movie exhibition houses rely on concession sales to keep their businesses viable. Although concessions account for only about 20 percent of gross revenues, they represent some 40 percent of theaters' profits. That's because while ticket revenues must be shared with movie distributors, 100 percent of concessions go straight into an exhibitor's coffers. Looking at detailed revenue data for a chain of movie theaters in Spain, Wesley Hartmann, associate professor of marketing at the Graduate School of Business, and Ricard Gil, assistant professor in economics at University of California, Santa Cruz, proved that pricing concessions on the high side in relation to admission tickets makes sense. They compared concession purchases in weeks with low and high movie attendance. The fact that concession sales were proportionately higher during low-attendance periods suggested the presence of "die-hard" moviegoers willing to see any kind of film, good or bad--and willing to purchase high-priced popcorn to boot. "The logic is that if they're willing to pay, say, $10 for a bad movie, they would be willing to pay even more for a good movie," said Hartmann. "This is underscored by the fact that they do pay more, even for a bad movie, as is seen in their concession buying. So for the times they're in the theater seeing good or popular movies, they're actually getting more quality than they would have needed to show up. That means that, essentially, you could have charged them a higher price for the ticket." Should theaters flirt with raising their ticket prices then? No, says Hartmann. The die-hard group does not represent the average movie viewer. While the film-o-philes might be willing to pay, say, $15 for a movie ticket, a theater that tried such a pricing tactic would soon find itself closing its doors. "The fact that the people who show up only for good or popular movies consume a lot less popcorn means that the total they pay is substantially less than that of people who will come to see anything. If you want to bring more consumers into the market, you need to keep ticket prices lower to attract them." Theaters wisely make up the margin, he says, by transferring it to the person willing to buy the $5 popcorn bucket. The work of Hartmann and Gil substantiates what movie exhibitors have intuited all along. "The argument that pricing secondary goods higher than primary goods can benefit consumers has been circulating for decades, but until now, no one has looked at hard data to see whether it's true or not," says Hartmann. In another study examining Spanish theaters, the researchers discovered: Moviegoers who purchase their tickets over the Internet also tend to buy more concession items than those who purchase them at the door, by phone, at kiosks, or at ATMs (the latter option has not yet hit the United States). More research is needed to figure out why, but for now this suggests that theaters may want to be sure to partner with an Internet service to make such ticketing available--or even take the function in-house. 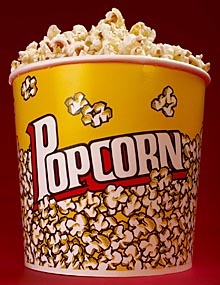 People who come to the movies in groups also tend to buy more popcorn, soda, and candy, Hartmann and Gil found. While this, too, merits more investigation, it may be that such groups comprise families or teenagers. "If that turns out to be the case, it may be that theaters will want to run more family- or adolescent-oriented movies to attract a more concession-buying crowd," Hartmann says. Analyzing data along the lines suggested by Hartmann and Gil can also support other pricing schemes for businesses that sell concessions, such as baseball parks. Taking the kids to a ball game can be a pricey proposition for many families, once you take into account all the hotdogs and memorabilia. "If we found the current pricing scheme turns away such a group, theory suggests that the firm might want to throw in a free baseball cap or bat," Hartmann says. "That raises the quality of the experience and provides an incentive for families to show up."